Facebook recently pushed out five big feature changes to Facebook pages that will help admins more easily manage their pages, plan content and get more airtime for updates in the news feed. 1Facebook rolled out a new feature to pages that allows administrators to schedule updates for a future date and time. You can schedule a post up to six months in advance in 10-minute intervals, from your page’s sharing tool by following the instructions in the video at top. 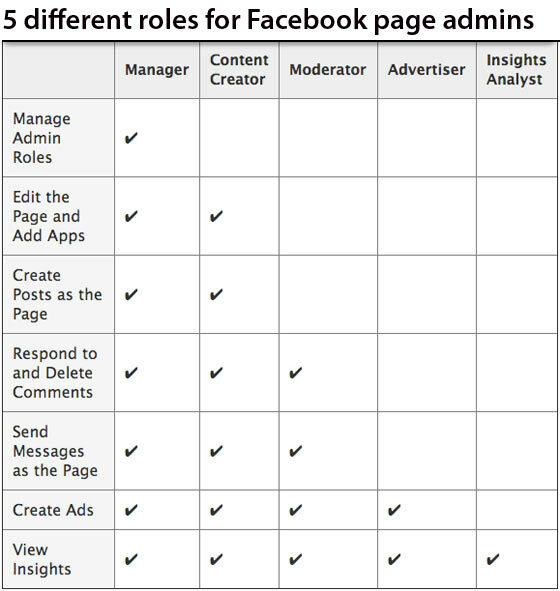 2Facebook pages now offer five different flavors of admin roles. This is huge, especially for organizations that have various different people accessing administrative rights with in a single Facebook page. Some of these people might need access only to view Facebook Insights, while others need admin access to post content and respond to comments. The five roles are described in the table below. Target audience: Nonprofits, foundations, NGOs, social enterprises, cause organizations, brands, businesses, Web publishers. Afew weeks ago, Facebook announced that Facebook was doing away with Welcome pages. As with most changes that Facebook makes, the people who hate change were very upset. But the critics are wrong. Strategy will always trump technology, and the only real limitation is simply a lack of creativity. You may already know about the Nonprofit Facebook Guy, a resource I created a few months back to help shorten the Facebook learning curve for nonprofits. If you have an idea for a blog post you’d like to see, please leave your idea on the Nonprofit Facebook Guy’s Facebook Page. This article originally appeared at JohnHaydon.com. 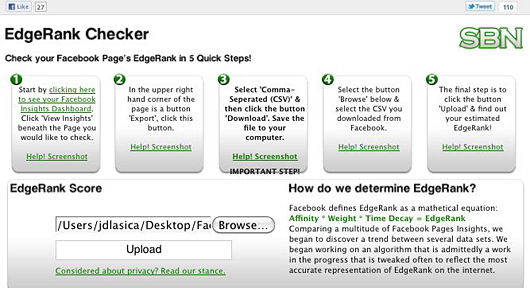 New tool: The EdgeRank Checker app shows how well your Facebook Page is performing. Over the years, Facebook has become a central part of our online social presence — for nonprofits, organizations and our personal brands. 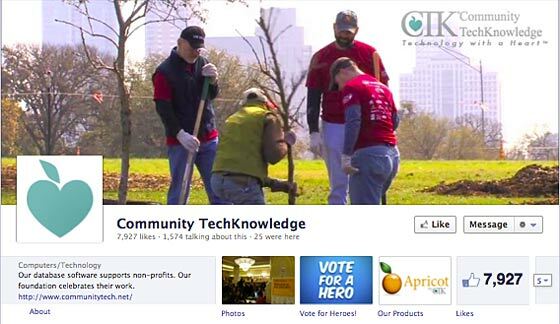 So why do so many nonprofits and organizations know so little about how the heart and soul of Facebook actually works? I’m referring to the Facebook News Feed, featured in a Chevy Cruze commercial in the second quarter of yesterday’s Super Bowl. In this series, we’ll offer tips on how to use Facebook much more effectively as a professional by taking charge of your News Feed. We’ll dissect Facebook’s secret sauce, called EdgeRank, to help you build authority with the right touch, tools and tactics. And we’ll give you tips on how to expand your organization’s reach and influence on Facebook. Facebook is far more than a social network: It’s also a personalized news network powered by a highly dynamic engine that’s personalized, relevant and timely. The crown jewel of this dynamic landscape is the News Feed. The News Feed consists of the content continually fed into the center column of your home page from people and Pages you follow on Facebook. 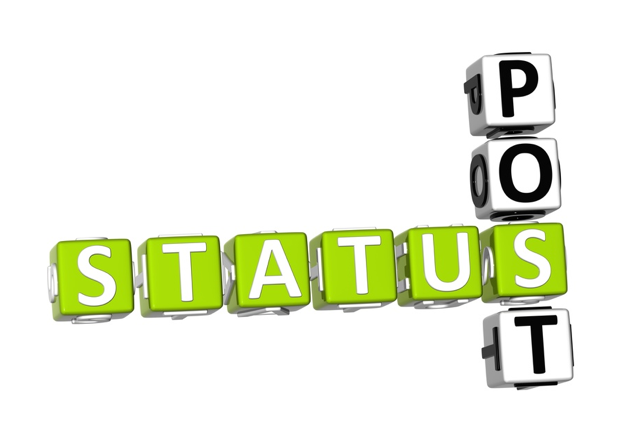 You’ll see status updates, photos, photo tags, videos, friend requests, event RSVPs and group memberships. Facebook’s news feeds have evolved significantly since the first one was introduced in 2006. With close to 600 million members, Facebook handles billions of individualized feeds — an impressive feat of engineering, if you to stop to think about it. Some members may not realize it, but the news stream you typically see on your page displays only a small portion of the updates posted by your Facebook friends. A few weeks ago Facebook tweaked the Most Recent feed. Now you have the option to display photos, Page updates & posts on Friend Lists.